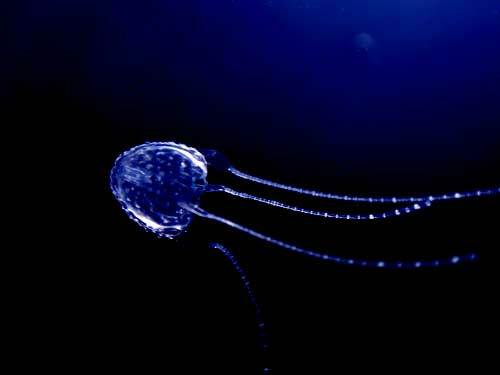 Irukandji Jellyfish are very tiny and extremely toxic. Found primarily around Australia, the sting syndrome is far from a pleasant one. Symptoms consist of extreme pain at various parts of the body , nausea, vomiting, migraines, perspiration, rapid pulse, high blood pressure and even a feeling of impending doom as some have died from the injury. This jellyfish not only has the ability to sting with their tentacles but can also sting those who come into contact with only the bell of this jellyfish. Virtually impossible to see in the water, they are about the size of your pinkie fingernail and have a transparent or opaque color.Vinegar is very effective but it is imperative you seek immediate medical attention to treat the sting.